Sorry, your words weren't clear, hidden behind the mechanical fog where calibrated guns like to go off. Maybe they hypnotized me. Sometimes a bad year is impossible to get over, and sometimes it makes you better. The new bridges and powerlines mini album assumes the latter. Better is the chronicle of a tumultuous year marking the end of major personal relationships for band members, its tracks named for the Brooklyn neighborhoods that formed the backdrop. An honest and hopeful New York story, the album is a cohesive and mature work. It’s the sound of a band that has played together for six years, and at the same time returns to the nervous energy that defined their earliest releases. The band ventured into the studio in late 2012 to record better. With guest appearances by members of Bon Iver, the record draws on the frenetic, often dissonant indie rock that has always inspired the band. Kieran Kelley (known best for his work on Sufjan Stephens’ ‘Illinois’) produced the album along with bridges and powerlines, and veteran Adam Lasus (Yo La Tengo, Clap Your Hands Say Yeah) provided a propulsive mix. The story of bridges and powerlines goes back to 2006, when the members met and realized a common love for both harmony-laden three-minute pop songs and the angular indie rock of 90s college radio bands like Guided by Voices and the Archers of Loaf. This union produced a critically acclaimed debut EP, described as “an exhilarating racket,” (sixeyes) and “a taught example of why [bridges and powerlines] should be added to your list of bands to watch.” (IGN.com) The success of their EP attracted producer Chris Zane (Passion Pit, The Walkmen, White Rabbits), and the band spent much of 2007 writing and recording their debut album Ghost Types. The album received favorable nods in multiple influential outlets from Pitchfork (“Now that’s power”) to Yahoo Music (“Incontrovertibly fun”). The lead singles from that record, “Uncalibrated,” and from their self-titled debut EP in 2006, “Carmen,” have been downloaded over 100,000 times. 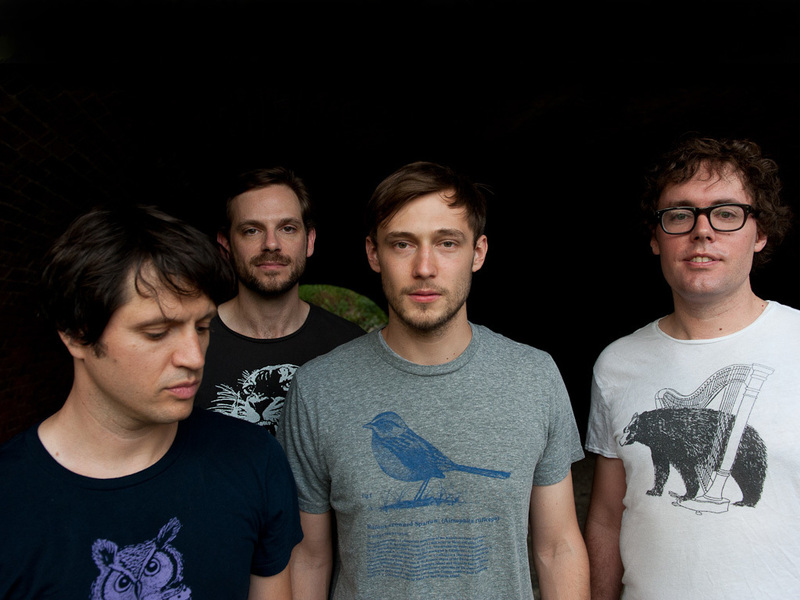 These records were followed by several successful tours including regular appearances at SXSW at CMJ. bridges and powerlines has also played shows supporting friends The Antlers as well as Clues, Anathallo, Women, HEALTH, Chappo, Drink up Buttercup, Margot and the Nuclear So and Sos, +/- and many others. In 2011 they released their follow-up album Eve, the culmination of their thoughts on life prior to the changes of 9/11. With producer Kieran Kelley the band spent three months in the studio painstakingly creating the record “they wanted to make their whole lives.” Critics praised their efforts, calling Eve “a big winner” (Popmatters) and “ridiculously addictive” (RSLblog). Their newest record, Better, was released in Spring 2013.